Several of Africa’s so called Big Five - elephant, rhino, lion, buffalo and leopard - are threatened with extinction due to man’s encroachment on their habitat and thirst for ivory and rhino horn. Specifically, the animals most at risk are lions, rhinos and elephants. The lion population has declined dramatically in recent years. Rhinos are being poached at an ever increasing rate for the “believed” medicinal properties of their horn. And elephants are disappearing at an equally alarming rate, coveted for the value of their ivory. How do we combat this catastrophe? Dedicated scientists, wildlife experts, and rangers are busily studying these problems for solutions. Dame Daphne Sheldrick, of the David Sheldrick Wildlife Trust in Nairobi, has devoted her life to rescuing infant elephants orphaned by poachers. Dr. Cynthia Moss, an American, started the Amboseli Elephant Research Project in Kenya to study elephant behavior in 1972. And at the Ol Pejeta Conservancy, located at the foot of Mt. Kenya, Africa’s second highest mountain, the not for profit organization provides a sanctuary for black rhinos, and the world’s three remaining northern white rhino, together with a haven for orphaned chimpanzees. More recently, in the world famous Masai Mara National Reserve, a UNESCO World Heritage Site, efforts are being made to study lion populations to better understand the threats and solutions. This safari visits all four projects, to gain an insight into the issues while witnessing the current abundance of wildlife all around, now in great danger of disappearing for all time. Pat Awori, a Kenyan, leads this exciting safari and provides provocative insights into life in Kenya. Pat has been involved with safaris from an early age and has worked with some of the most prominent safari operators in Kenya. She is also an avid conservationist serving in different capacities with several conservation organizations. Join us for a unique and exclusive safari, with an in-depth look at conservation in Africa, visiting conservation experts, accompanied by an expert and in a small and personal group atmosphere. Pat Awori was born and raised in Nairobi. She was educated in the USA and holds a B.A. degree in International Relations, with a minor in the Behavioral Sciences. Her devotion and expertise in history and wildlife conservation programs along with her passion for Kenyan folklore, ancient traditions, and music, contribute to making this safari an unforgettable experience. Arrive at Jomo Kenyatta International Airport in Nairobi and after clearing Immigration and Customs formalities, proceed to the international arrivals, where you will be met by Pat Awori, your Tour Director. Meet your driver guide and transfer to your luxury boutique hotel - Hemingways Nairobi. Hemingways Nairobi is located in the quiet and exclusive suburb of Karen. The elegant architecture fits discreetly into the rolling landscape, optimizing the views over the forested valley and the famous Ngong Hills. Your junior suite opens out onto a balcony with views of The Green Hills of two of which are penthouse style Presidential Suites, include a valet service. There is a wellness center on site, along with a pool, gym and spa. Enjoy dinner at the hotel tonight. Enjoy breakfast at the hotel and then depart for a day of excursions in the beautiful Karen area. Begin with a visit to the Giraffe Centre which offers the unique experience of hand-feeding these gentle giants at eye level from a raised platform, while watching the warthogs below snuffle around looking for tidbits. The centre is the headquarters of the African Fund for Endangered Wildlife (AFEW), which was set up to raise money to relocate the endangered Rothschild giraffe to safe areas. Enjoy a delightful lunch at the Talisman, a popular restaurant in Nairobi that serves up a delicious fusion of European, Pan-Asian and African cuisines. The deco features carved wooden pillars from Pakistan, elegant Afghan rugs, charming fireplaces a sprawling terrace and a beautiful garden. After lunch visit the Ocean Sole Foundation’s shop. Passionate about the ocean, its ecosystems and marine wildlife, Ocean Sole recycle flip-flops that are found littered on beaches and in the waterways of Kenya. As a bizarre and yet very real phenomenon, thousands of flip-flops are washed up onto the East African coast creating an environmental disaster. The discarded flip-flops are transformed into elephant, giraffe, lion, rhino, dolphin and other attractive pieces and each piece comes with an important message about marine conservation. Then visit Kazuri Beads which was started to help women around Nairobi with regular employment so that they could support their families and educate their children. Meet the women and chat with them about their lives as they work. The jewelry also makes great gifts! The rest of the afternoon is devoted to a private visit of the David Sheldrick Wildlife Trust’s Elephant Orphanage. Here you will be able to interact with the young elephants and talk to their keepers to learn more about this worthwhile project and the importance of the elephant in Africa’s conservation efforts. The David Sheldrick Wildlife Trust’s elephant Orphanage is a small charity, established in 1977 by Dr. Dame Daphne Sheldrick to honor the memory of her husband, famous Naturalist, David Sheldrick, the founder Warden of Tsavo East National Park in Kenya. For over 25 years Kenya-born Daphne lived and worked alongside her late husband and during that time she raised and rehabilitated back into the wild orphans of misfortune from many different wild species, including elephants aged two and upwards. She is a recognized international authority on the rearing of wild creatures and is the first person to have perfected the milk formula and necessary husbandry for both infant milk dependent elephants and rhinos. For her work in this field Daphne has received several prestigious awards. 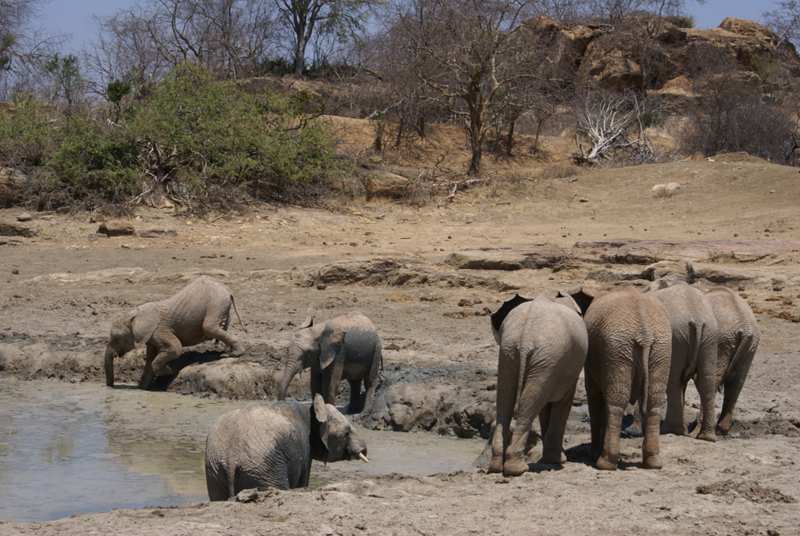 The elephant orphans raised by the Trust are gradually rehabilitated back into the wild elephant community of Tsavo National Park when grown, a transition that is made at their own pace and in their own time, but usually takes eight to ten years. Adopting one of these special animals gives it a second chance at living freely in the wild. Spend time with the elephants as they get ready to settle down for the night before returning to Hemingways Nairobi for dinner. This morning, set out on your full-day journey by road to Ithumba, a total immersion elephant camp run by the David Sheldrick Wildlife Trust, located in Tsavo East National Park. Ithumba is available only to ‘Foster Parents’ who come to see the orphaned elephants which have been brought to the area to start the process of integration into the wild. Behind the camp is Ithumba Hill which one can climb to get an amazing view of the expansive wilderness of the northern area of Tsavo. From the lounge area upstairs, one can enjoy the spectacular sunsets and sunrises for which Tsavo is known, often with Kilimanjaro visible above the distant southern horizon. Settle in to your comfortable tent accommodations and keep a lookout for the variety of birdlife and several species of antelope, baboons and even lion that often come to drink in the small fresh water pond. Rise early for a morning visit with the elephants as they leave the stockades. Return to your camp for a leisurely breakfast followed by some relaxing time in one of the many viewing areas. Late morning, you’ll have an opportunity to spend time with the orphaned elephants as they play in the mud, trumpeting and rumbling as they mingle with each other and wild elephants that often join them for a drink and a mud bath. Back at camp a delicious lunch awaits followed by leisure time to enjoy the ambience and serenity of the area. Relax on the deck overlooking the pond and watch for birds and wildlife, socialize with your traveling companions, or perhaps, take an afternoon nap. In the late afternoon, meet the orphans and their keepers as they return to the stockades for the night. After breakfast, depart for Amboseli National Park, arriving at Tawi Lodge in time for lunch. Tawi Lodge is located in a private conservancy of 6,000 acres, just five minutes from the eastern entrance to Amboseli National Park. The lodge offers stylish cottage accommodations with en-suite bathrooms outfitted with bath and shower, fireplaces, and mini bars. Each cottage has its own wooden-deck veranda with views of Mt. Kilimanjaro. This afternoon, pick up your camera and hat and head out for a thrilling wildlife drive and visit to the Amboseli Elephant Research Project. Amboseli Trust for Elephants (ATE) research arm, the Amboseli Elephant Research Project, has made many important contributions to elephant research over the years. Cynthia Moss, a renowned conservationist, started this project in 1972 with her colleague Harvey Croze. She and her research associates have identified and recorded more than 1,400 Elephants. The knowledge gained from this research has profoundly altered the way we think about, conserve, and manage elephant populations. Learn about the African Elephant family structure, life cycle, behaviors and much more from your encounter with the research team, and discover how this important research has contributed to the conservation of the precious and dwindling African Elephant population. This morning, set off on an exciting wildlife viewing drive and exploration of Amboseli National Park. The beautiful snowcapped peaks of Mt. Kilimanjaro tower in the background, while elephants, buffalo, wildebeest, zebras, giraffes, lions, cheetahs and leopards roam wild and free. Return to the lodge for a delicious lunch and some rest. Late this afternoon, gain a different perspective of the landscape on a nature walk with your expert guide. Rise early for breakfast and then transfer to the airstrip for a short flight to Nairobi. Upon arrival, you will be met by your driver guide at Wilson Airport for your drive to Ol Pejeta Conservancy. The journey will take you through rich agricultural land with a stop at the Equator. 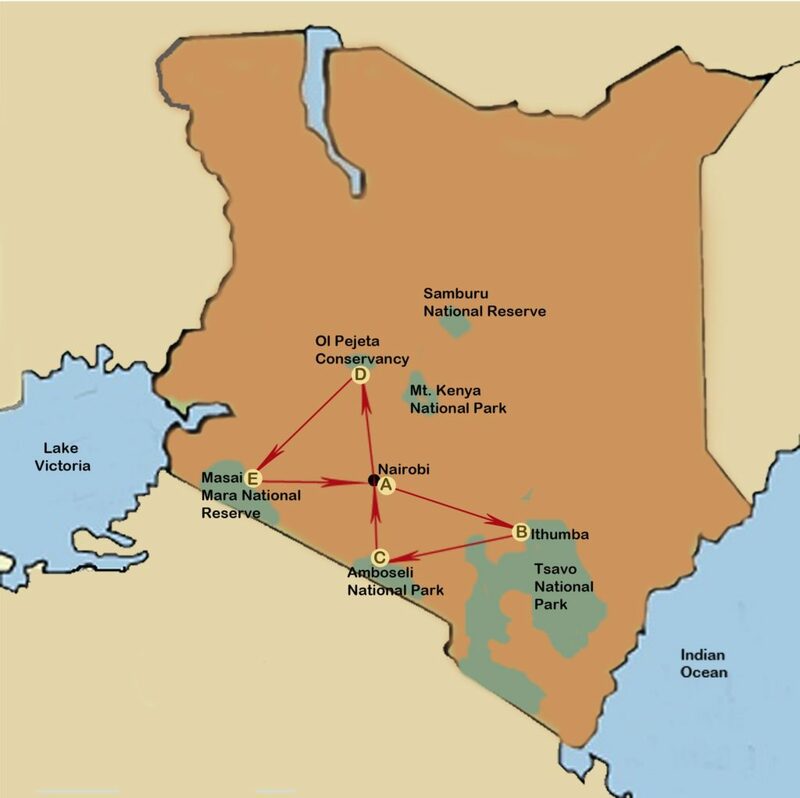 Ol Pejeta Conservancy lies in Central Kenya’s Laikipia County, between the foothills of the Aberdares and Mount Kenya. Arrive at Ol Pejeta House in time for lunch. 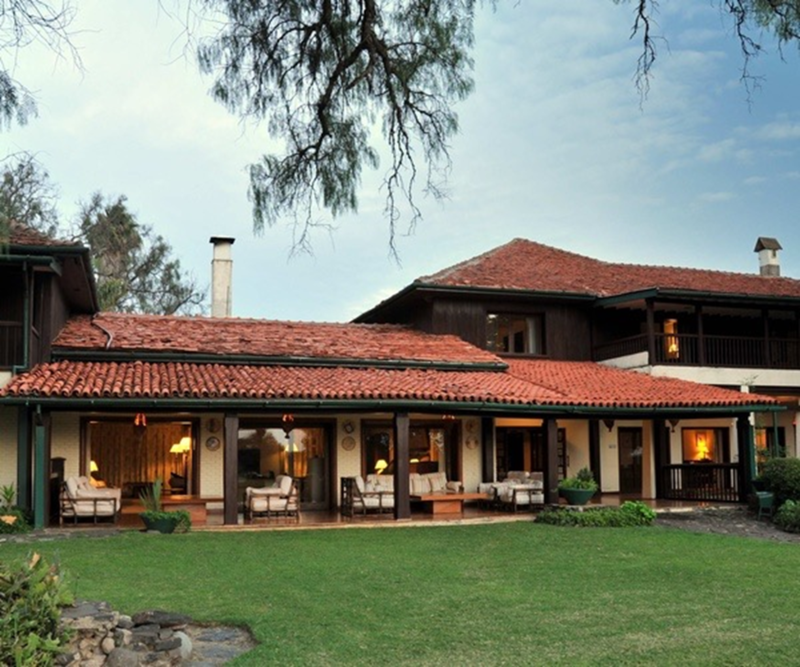 Once the exclusive ranch house of multi-millionaire Adnan Kashoggi, the magnificently presented Ol Pejeta House stands at the center of the private conservancy. 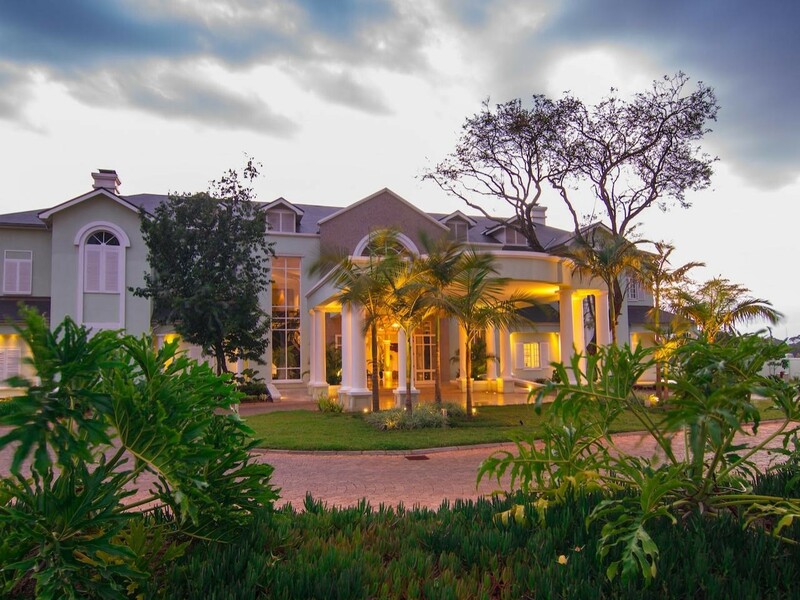 Set in extensive grounds with glorious view of Mount Kenya, the mansion features an elegant drawing room with fireplace, and scenic verandas surrounding the building. Rest up after lunch and then get ready for your late afternoon game drive in the conservancy. Enjoy exploring more of the conservancy today. Ol Pejeta is a private 90,000 acres wildlife conservancy and home to Kenya's largest population of Black Rhino, a large number of elephant, cheetah, lion, leopard and plains game, including rarer game found in the North, such as Grevys zebra, Jacksons hartebeest and Beisa oryx. There is a small Wildlife Educational Centre which is interesting for both children and adults alike and a Chimpanzee Sanctuary for orphaned chimps offers the opportunity to learn about the perils facing chimpanzees in the wild. Late this afternoon, visit the Northern White Rhinos of Ol Pejeta, the only three left in the world. Najin, Fatu and Sudan, were moved to Kenya from the Czech Republic in 2009. Since Ol Pejeta is one of East Africa’s largest Black rhino sanctuaries, with well qualified and experienced staff, it was assessed to provide the best home for their continued survival. 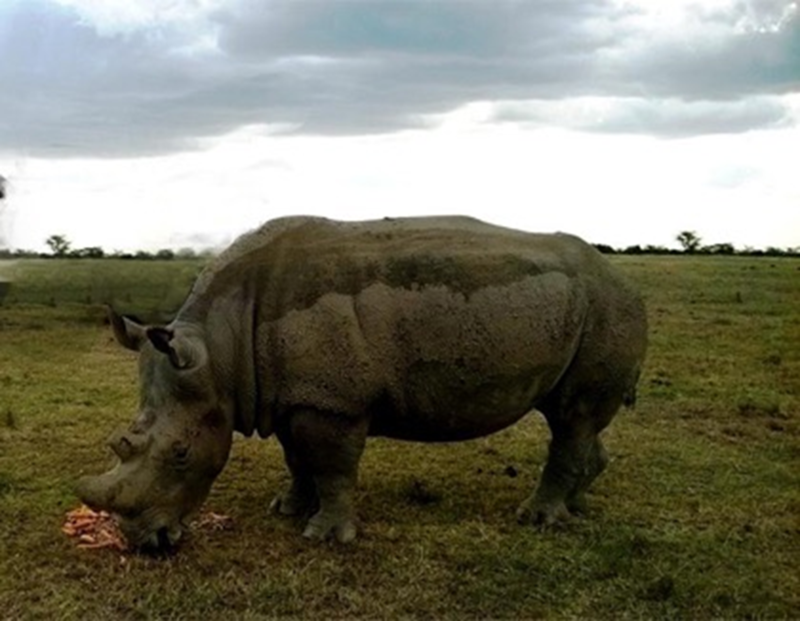 It is hoped that the climatic, dietary and security conditions that the rhinos enjoy at Ol Pejeta will provide them with a higher chance of reproducing and reviving the population. This morning transfer to Nanyuki Airstrip for a scheduled flight to Masai Mara. Upon arrival at the airstrip you will be met by a camp driver guide and transferred to Mara Ngenche Safari Camp, arriving in time for lunch. 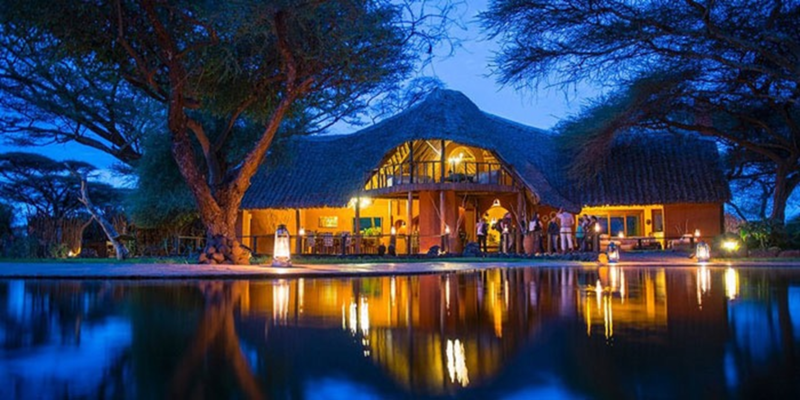 Mara Ngenche Safari Camp is located on the banks of the Mara and Talek Rivers, in the heart of the Masai Mara. The spacious guest tents are all en-suite with a bath tub and outside shower and decorated with a fusion of modern African decor. 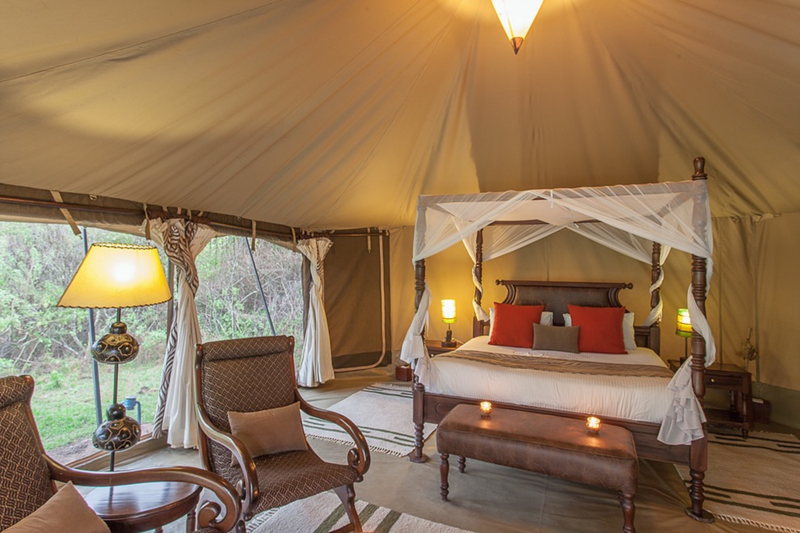 Each tent has a four poster king-sized bed with views of the Mara River and is partially enclosed in its own boma. The camps dining and lounge area have an open-sided design with views of the river where pods of hippo and crocodiles can often be seen relaxing on the banks. Return to the camp to freshen-up after the game drive. This evening there will be a talk on the Mara Lion Project. The project was started by the Kenya Wildlife Trust to try and ensure the future conservation of Kenya’s lions in the Greater Mara Ecosystem. The African lion population has been reduced by almost half in the last three decades and continues to decline. Masai Mara is one of Africa’s greatest wildlife reserves. Acacia dotted plains, tree-lined rivers and woodlands are abundant with wildlife and an array of birdlife. Game viewing is spectacular year round; you may see a pride of lions stalking their prey, observe a herd of elephant and their fascinating social structure, or see pods of hippo wallowing in the rivers. Awaken to morning tea or coffee and head into the reserve on an early morning game drive with your expert driver guide. Just as the sun is rising you’ll see the nocturnal animals just turning in and the grasslands come alive with wildlife beginning their day. Return to camp with an appetite for the delicious hearty breakfast. On one of the days, Maasai Chief Ole Nairuko, who is one of the camp guides and cultural ambassador, will organize a special welcome ceremony for you at a traditional Maasai village. The Maasai are proud pastoralists and warriors. Spend time in the “Manyatta” and immerse yourself in one of earth’s oldest cultures. The ladies and children will entertain with traditional songs and while at the village see how they go about their daily lives in a very traditional way, like making fire with sticks! You will also visit a nearby school. Spend time singing with the children, meet the teachers and learn about the school and the challenges they face. Late afternoon you will have the chance to venture out for another wildlife viewing encounter. Each game drive offers a different experience. The richness of the wildlife is breathtaking. A network of streams provides water for the elephant, buffalo, cheetah, leopard, lion, antelope, giraffe, zebra, wildebeest, hippo, and crocodile to live here in balance with the environment. You never know what you’ll see when you turn a corner. You may opt for a sunrise Hot Air Balloon Safari ending with a champagne breakfast in the bush for an additional cost. Enjoy breakfast at the camp and then transfer to the airstrip for your flight to Nairobi’s Wilson Airport. On arrival you will be met and transferred to Tamambo Karen Blixen Coffee Garden for lunch. Tamambo Karen Blixen Coffee Garden is located in a beautiful tranquil garden setting and offers a wide variety of dishes. After a leisurely lunch, transfer to Hemingway’s Nairobi, where day rooms have been reserved for you. Later transfer to Jomo Kenyatta International Airport for your international departure flight. Most transfers between parks use light aircraft which results in a luggage restrictions. due to light aircraft luggage storage.  Hand baggage allowance 5kg (11lbs) – hand baggage is weighed. luggage and we request that you please discuss this with us before you travel. boots – preferably water-proof – are recommended when out in the bush. bush walks, and of course a sunhat is a must. Binoculars – an absolute must if on any type of safari. Many options are available but with this equipment invariably the more you spend the better you get. Flashlight – Many camps have no mains power so night-time lighting may be by candle or hurricane lamp, a lot of camps will have torches by the bed but best to pack your own. Glasses – if you wear prescription glasses bring a spare pair. If you wear contact lenses bring a pair of glasses as well since dust can be a problem. Camera equipment – This is obviously very personal but zoom or telephoto lenses are useful. Cleaning equipment and a dust proof bag are also useful. Spare batteries and memory cards are very important. Zambia's currency is the Zambian Kwacha (ZMW). Approximately $ 1.00 UDS is equal to 9.90 Kwacha. small local purchases such as drinks at the airstrips. The newest series of US currency and bills without any writing, markings or tears on the bills are accepted. notes are no longer accepted anywhere in Zambia. followed by MasterCard and American Express. Porters US$ 1 per person per day. Normally the guide/ranger is tipped separately in order to show your appreciation. You are strongly advised to consult your doctor prior to travel and get accurate and up-to-date advice on inoculation requirements, and anti-malarial precautions. Anti-malaria precautions are highly recommended and Insect repellent is recommended for use in the evenings. Yellow Fever Visitors arriving or planning to re-enter from countries where yellow fever is prevalent - Please ensure you carry your vaccination certificates. Water: Do not drink or brush your teeth with tap water. Bottled mineral water is available at all hotels and lodges. Drink plenty of water when staying outside in the sun, during the day. The Sun: The African sun can be very strong and sunburn can occur through clouds and even a light T-shirt. A bad sunburn can spoil your safari so be sensible, use cream and wear a hat. De-Hydration: in a mild form can be fairly common in the hotter months, it is not dangerous so long as you recognize the symptoms and react accordingly. The key is to keep body fluids up by drinking plenty of water. If nausea or vomiting result then medical attention should be sought It would be worth including a couple of packets of re-hydration salts in your holiday medical kit if you have such a thing. Diarrhea: is a common problem when traveling anywhere in Africa. You should find that standards of hygiene in all the safari camps booked by Holden Safaris to be very high, but it is not uncommon for individuals to react to a change in diet or water. The best bet is to be sensible about what you eat and drink and bring suitable medication just in case. transiting South Africa, an additional blank visa page is required for each entry. Once the application is in process, the e-Visa application fees are non-refundable. Electronic applications may be accepted at a later date. visit Botswana for day-trips through the Kazungula borders. office to apply for a replacement entry permit before attempting to depart the country. The Plug type used in Zambia is: "Type C, D & G"
PLEASE NOTE: Some camps have limited or no electricity. Candles and hurricane lamps may be provided. illegal in the United States, if you purchase them you may also be breaking local law. Africa’s wild animals are unpredictable and potentially dangerous. 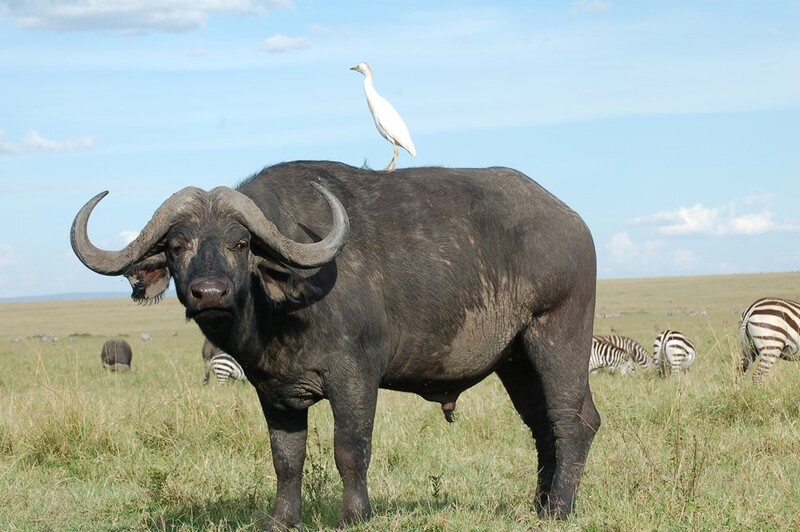 Photographic safari activities and staying in any safari camp, places visitors in close proximity to wild animals. Thus, there exists an inherent risk to those persons wishing to undertake these activities. Whilst every care is taken by sub-contracted camps and operators and their personnel to minimize exposure to risk, Holden Safaris together with sub-contracted tour operators bear no responsibility whatsoever for any loss, injury, illness, death, delays, cancellation of flights or change of itinerary and retain the right to alter, amend or cancel any part of a safari with just reason. Full medical, property and travel cancellation insurance is strongly advised. All guests are advised to insure fully prior to travel.